Drivers in 14 state highway corridors in Maryland will see their travel times cut over the next year as a result of a $50 million upgrade to traffic signals, Gov. Larry Hogan said Oct. 25. The new system, billed as the second phase of Hogan’s program to relieve traffic congestion, will use artificial intelligence to better coordinate signals and improve traffic flow, officials said. “Nearly 700,000 Marylanders will benefit every day from these transformational improvements,” Hogan said during a news conference at the State Highway Administration’s operations center in Hanover. 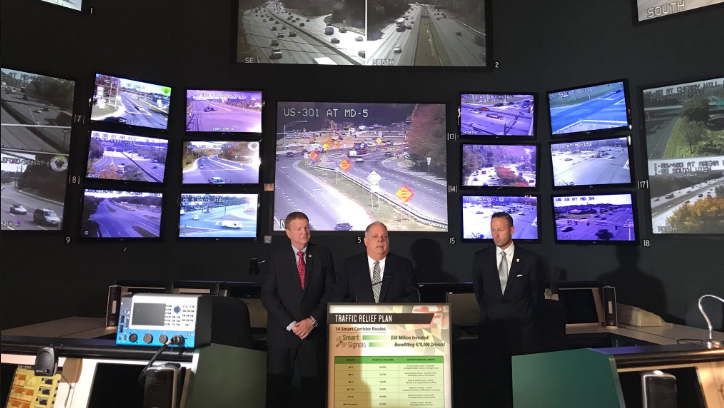 The “Smart Signals” program follows Hogan’s announcement of a $9 billion initiative to add lanes to the Capital Beltway, Baltimore-Washington Parkway and Interstate 270. While much smaller in scale, the second phase is expected to deliver more immediate congestion relief. Transportation Secretary Pete Rahn said all 14 corridors will be upgraded with the new technology by the end of 2018. He said the first corridor to receive the improvements, Route 2 (Shirley Highway) in Anne Arundel County, will have them installed in about a month. Other Baltimore-area highways that will be upgraded include Route 3 in Anne Arundel, U.S. 40 in Catonsville, Charles Street in Baltimore County and U.S. 1 in the Jessup-Elkridge areas of Howard County. Other corridors include U.S. 1 Business in Bel Air and Route 22 in Aberdeen. The others are in the Washington suburbs and Southern Maryland. Officials said the money for the system is already in the state transportation budget.